I was on TV last night. OK, it was BBC3, but it was still TV. You can see it here. Let me explain what it was about. A while back I was contacted by the producer of a show called ‘Britain’s Really Disgusting…’, who were doing an episode on drinks. I was really wary about getting involved. I think the wine industry is pretty sound, and that wine – even the most industrial wine – is quite natural in that no flavourings are allowed, although many processing aids are permitted (these aren’t as bad as they sound). So I have no problem with the soundness of commercial wine. What I do have a problem with is the way wine is sold. In particular, I think that tactical brands (aka trade drivers) are bad, and I’d like to start a campaign against them. Tactical brands are wines that are dressed up to look like more expensive wines, and then put on the shelf for double what they are really worth. Then they are sold on special half-price deals. A Champagne reduced from £30 to £15? Sounds like a great deal, but it usually isn’t. Wine normally at £7.98 being sold for £3.98? It must be better value than other £4 wines, mustn’t it? My problem with these trade drivers is that they deceive customers. They are not honest. It’s bad for wine generally, and heavily discounted wines like these cannibalize sales of wines that are appropriately priced and which don’t play the same game. I understand the need for some promotion, and I don’t want to grumble too much about wines that are £6.99 with the occasional promotional activity at £4.99, although I’d rather that wines were sold for the price they are listed at. I’m pictured here with presenter Alex Riley doing some undercover filming in supermarkets, pointing out the tactical brands. Fair point on trade drivers, but unless all multiple grocers get around a table at once and agree to phase them out, then unfortunately they are here to stay. It’s our own fault as an industry, and we’ve conditioned the UK consumer to buy on promotion and price discount. Wine in many other countries holds a certain prestige, or place within tradition and heritage. Here it is no more than an FMCG product to many, and that is the problem. Brilliant! I love the supermarket responses (I get the impression that they think they can seemingly justify every price on their wines). I’ve a feeling this blog is going to elicit a number of comments! I’ll be checking to see if Asda or Tesco send one in! What’s needed is more education of the public, thanks for this Jamie. The more these tactics are higlighted to the public the more the man on the street will learn not to trust the supermarkets and hopefully go back to independents with whom they can build a relationship based on trust. I realised after trying several “half-price” supermarket wines that something was amiss. Most if not all were not brilliant value at the discounted price, never mind the supposed full price. I suspect you can always find better value non-discounted wines on the main shelves for the same price (even if you just have a fiver to spend). It’s not just the supermarkets that use this tactic. Some mail-order merchants regularly offer “vouchers” on a specific selection of their wines. It’s a bit like the Pizza Express two-for-one thing: it becomes difficult to say what the ‘true’ value of a product is. But businesses need to be careful doing this, as they run the risk of losing the trust of their customers who start to question the “standard” prices. 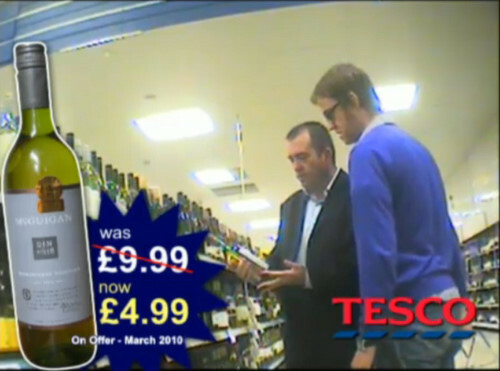 I remember Tim Atkin covered the half-price wine issue, and pointed out that to be labelled as “half-price”, a wine must have been on sale at the full price in at least one store for 28 days, and that’s the only legal requirement. As you say, most people have no clue and are not prepared to do the research so what’s wrong (ethically) with using price as a marketing tool along with brand, labelling, advertising, placement and endorsement; caveat emptor! If you follow this logical path you must conclude that all marketing is unethical, a slightly unrealistic position IMO? I agree with Roger, if punters don’t like it then they need to shop independent where reputation is top dollar and not price, this requires investment on their part however. Fully agree with the thrust on false pricing. Minor quibbles about someone firmly asserting what a wine IS worth aside, there’s no doubt that an ill-informed wine-buying public are often being duped by false offers. The empty shelves for ‘offer’ wines are no set-up and seen every day, in every supermarket. The earlier section on additives wasn’t as balanced / appropriate and it came across as dumbed down ‘watchdog’ style telly. Arguably as misleading as it claims the wineries/supermarkets to be. Nice advertising for Mr Waldin though (better than his farcical TV programme). Well done for getting involved Jamie (even despite the qualms I have about the oversimplified approach of the other aspects of the piece). I’m glad the issue made it onto telly, hot on the heels of some critical comments on the practice from Tom C on his slot on ‘The hour’ in Scotland. Such criticism is timely and justified and I’d like to see it echoed again and again until the public awareness of the trick (across the board, not just on wine) becomes sufficient to spot the deception. Finally, Sainsbury’s response was a (fingers in ear, “la la la not listening”) disgrace. Then again, their wine range is utterly lamentable, so no great surprise. Trading standards allow this process of discounting – so technically the supermarkets are doing nothing wrong. It is the supermarket which dictates the price point and promotional mechanic on shelf – the supplier has to deliver the economic margin required by the supermarket or they will not be on the shelf in the first place. Quality if subjective and asking an ‘expert’ if a wine is good at 4.99 can be misleading, as the person who actually buys and consumes the wine is the ultimate judge. This same consumer might not like a wine the expert decide is excellent and of the highest quality. Let us forget that the program tells us they are experts and we should simply believe that. If a wine sells at full price and half price then why can it not considered a good commercial product? Or is wine somehow different? Maybe it does make the customers feel good and actually enjoy the wine? It does wind me up, but I can’t come to a rational and sensible idea on this. It’s not just about wine – it’s a zeitgeist thing. Anyone know what episode this is? Might be able to find it on YouTube. I also can’t get i-Player outside of the UK.